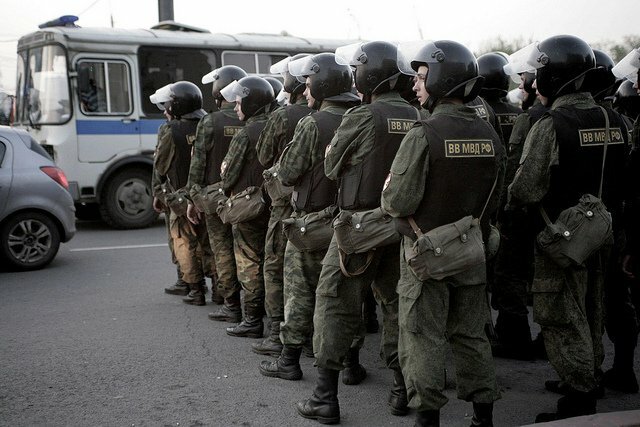 Back in the middle of the 2000s, Russia’s Ministry of the Interior (MVD) began to train its Special Police Force units for deployment against protestors. Last June, the Ministry created a “Special Reaction Force Operations Centre”, headed by Major General Vyacheslav Khaustov (Russian police forces use military-style ranks and command structures). The reorganisation brought about a rise in the status of the MVD’s special forces, which, according to deputy minister Mikhail Sukhodolsky, are now ‘at their highest level in the entire history of the Ministry’. The new centre, based at Strogino, on Moscow’s outer ring road, is officially charged with ‘the prevention and curtailment of public events that have not been officially sanctioned’. Among the resources now at Khaustov’s disposal are the OMON (Special Purpose Mobile Unit) and SOBR (Special Rapid Response Unit). When the authors of this article contacted the Operations Centre’s press office, they refused to give us any details about the size of these units, claiming that such information was confidential. We can assume, however, that the overall figure is at least 2,000 people, since Khaustov himself said in an interview in November 2011 that more than 2,000 operatives had undergone regrading. The vast majority of the Centre’s employees will have come from OMON, since SOBR units do not usually exceed a hundred in number (according to the press office, SOBR is never used to police marches and rallies). The task of policing mass demonstrations instead usually falls on the 2nd Regiment of Operational Police, responsible for public order in Moscow. According to MVD figures, this regiment is 1119 members strong. Such units are ordinarily supported by the MVD’s Internal Troops (VV), who act as a type of paramilitary national guard force. This is the largest human resource at the Kremlin’s disposal in crisis situations. It includes the Feliks Dzerzhinsky Rapid Response Division, numbering around 10,000 troops, and the Sofrinsky Brigade with about 2,600, both based in the Moscow Region. Moscow city itself has the 55th VV Division, with six units based in the capital, and two in the surrounding region. This numbers around 6000 troops, who are regularly used to line demonstration routes and patrol the metro network. A new unit, the ‘Peresvet’ Special Task Force, was formed from members of this division at the end of 2006, specifically to deal with mass unrest in Moscow. Its troops, many of them selected because they had served in war zones, are equipped with firearms, body armour, plastic shields and CS gas canisters, as well as armoured personnel carriers. The ‘Peresvet’ unit, unlike the other sixteen VV special task force units, is never sent to the conflict regions of the North Causasus, since the MVD requires it to be constantly available to suppress unrest in Moscow, the Moscow region and St Petersburg. It is also regularly used ‘for security purposes’ at football matches and on public holidays. The authors of this article saw members of the unit at the rally on Moscow’s Triumfalnaya Square on 31st May, for instance. Internal Troops of the Ministry of Internal Affairs act as a type of paramilitary national guard force. This is the largest human resource at the Kremlin’s disposal in crisis situations. In the end of 2011 they had about 212 000 men (photo:www.flickr.com). Despite having all these forces at its command, the Kremlin is evidently still not confident that it can handle protest marches and rallies, so the Interior Ministry regularly calls in police and community support officers from other regions. According to MVD figures, 6,300 police officers were bussed into Moscow from the Central Region for the presidential election on 4th March, and 4,000 community support officers and employees of private security firms were also used on the streets. Over the last few years the MVD has been allocating considerable funds for the purchase of buses and special purpose vehicles. Muscovites have the pleasure of watching these armoured monstrosities move around every time a protest of some kind is held. Mass shipments of this new motor technology for the Special Police Forces began back in 2007. In December 2006 Victor Pivchenko, head of the Homeland Security Department of the MVD, announced, ‘we are planning to acquire more than 5500 vehicles — some of them destined for the Special Forces —, more than 100 buses based on the ‘Ural’ truck chassis and 30 armoured police cars’. In the same year OMON received 122 buses, based on the ‘Ural-4320’ chassis, for transport of its personnel. It is no wonder that when the ‘Ural’ company announced its 2007 end of year results it was able to boast of an expansion in production and the reintroduction of a second shift for the first time in 15 years. Armoured ‘Urals’ with bars on the windows may be good enough to transport detainees and rank and file OMON police, but the bosses want something a bit more comfortable. So the Service’s second vehicle of choice is the modern ‘Avrora’ coach, from the ‘Kurgan’ automobile works, fitted out for use by OMON senior ranks with air conditioning, an independent generator system, a radio transmitter, computers, and even TV and video. 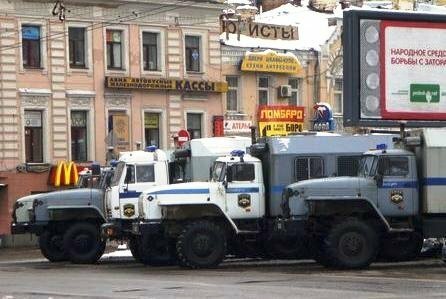 In the wake of the recent wave of protests Moscow’s police are now acquiring new armoured vehicles. In November 2011 the Special Reaction Force Operations Centre received a gift from the Moscow city authorities of a new model of bus based on the ‘Ural-4320’ chassis and named, appropriately, ‘The Predator’. As well as Predators, several armoured vehicles based on the ‘KamAZ ‘ truck chassis were seen on the streets of Moscow, and in May the MVD also placed an order for 167 armoured cars and trucks, to be delivered by November, with forty five of them going to an MVD base in the Moscow region. And if the police find all this technology insufficient for their needs, the Moscow authorities are happy to supplement them with their own service vehicles whenever streets and bridges have to be blocked off. For some years now, the Interior Ministry has also been developing and buying new types of specialised equipment for use at protest demonstrations, as part of its ‘integrated development plan for non-lethal weaponry’. One aim of this plan is to arm Special Forces’ personnel with composite weapons that combine a physical and chemical effect. One such is the ‘Drofa’ hand grenade, whose ear-splitting sound disorientates people nearby to the extent that they are powerless to escape its cloud of irritant gas with a range of 50 cubic metres. ‘Drofa’ has already been used against unruly fans after football matches. Who do they have in reserve? The Kremlin can also call on regional Special Forces personnel – 121 OMON units with a total of around 20,000 members, to be precise. In the second half of the 2000s, when the Russian government started making preparations for the suppression of large scale protests, senior MVD officials began planning to bring all regional Special Forces under central control (with the exception of SOBR, they had previously reported to their local Interior Ministry departments). There were also plans to develop a system for the Forces’ swift deployment in any part of the country where there was unrest. 'For some years now, the Interior Ministry has also been developing and buying new types of specialised equipment for use at protest demonstrations, as part of its ‘integrated development plan for non-lethal weaponry’. In the winter of 2011, a new department was created at the Interior Ministry to coordinate and integrate the work of the Ministry’s Special Police and Aviation Forces. A separate Centre for MVD Operational Special and Aviation Forces was also set up, based in the town of Shcholkovo, not far from Moscow. Bringing together OMON’s ‘Zubr’ (‘Bison’) unit, SOBR’s ‘Rys’ (‘Lynx’) unit and an aviation unit, the job of this centre is to act as a fire-fighter, dispatching backup teams to hotspots where local police forces are unable to cope. One such situation arose, for example, in December 2008, when mass protests broke out in Vladivostok against a rise in import duties on foreign-produced cars, trade in which was an important part of the local economy. The Kremlin did not feel confident in the loyalty of the local police, and flew OMON’s ‘Bison’ unit out to break up the demonstrations. Russia's Ministry of Internal Affairs has at its disposal large number of buses and special purpose vehicles (photo:polit.ru). In short, the Russian government began to increase its forces and resources for fighting mass protest seven years ago, long before the appearance of any political activism in Russia. This process continues today, increasing the likelihood that the Kremlin will succumb to the temptation to resolve any political crisis by sending in the heavy mob.